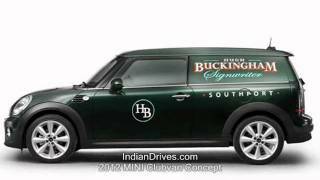 MINI Clubvan Concept will have its world premiere at the Geneva Auto Show 2012. 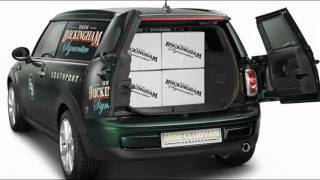 The Clubvan concept is targetted for business customers with its closed off load area behind the front seats and the opaque rear side windows; making it a perfect delivery solution, but something with a MINI style! Woodcliff Lake, NJ – February 18, 2012… Stand-out-from-the-crowd style can also be amazingly practical – and practicality can be surprisingly attractive. The MINI Clubvan Concept paves the way for an innovative vehicle concept without parallel in the premium small car segment. 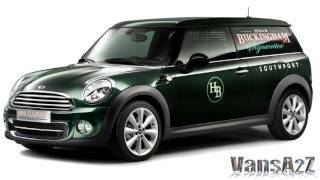 The MINI Clubman-based concept car, scheduled for its world premiere at the Geneva International Motor Show 2012, combines the driving fun for which MINI is renowned with increased load-carrying capability. The MINI experience will therefore find its way into new areas of life, the brand’s distinctive character gaining new popularity among target groups not previously on the MINI radar. The closed-off load area behind the front seats and the opaque rear side windows of the new concept set it apart most strikingly from the MINI Clubman, the platform used as its base. The MINI Clubvan Concept uses its broader skill-set to open up new usage possibilities – both business and leisure. Where a business’s customers, product range or operating environment demand a particular style for its vehicles, this premium model can make the perfect delivery solution. For example, a car in the mould of the MINI Clubvan Concept would fit excellently into the fleet of a fashion designer, art gallery owner or catering service. And its abilities as an all-rounder also tick the right boxes for a photographer with a stack of camera, tripod and lighting equipment to ferry around during the week – and bulky sports and leisure gear to pile on board at the weekend. The MINI Clubvan Concept pulls off the trick of blending enhanced practicality and a well-judged lifestyle focus with natural ease. This ability is based on the impressive adaptability that goes to the heart of the MINI brand’s heritage. Calls for maximizing the load capacity of the classic Mini began as early as 1960, just a year after the car’s birth; and they were soon heeded. With its 10-centimeter-longer wheelbase (3.94 inches), separate load compartment and split rear doors, the Morris Mini Van was perfectly equipped for commercial use. It also provided the basis for the fully glazed, four-seat Morris Mini Traveller, one of the precursors of today’s successful MINI Clubman. And so, more than 50 years on, the MINI Clubvan Concept sees history repeating itself – albeit in a slightly different order. Impressive practicality and the brand’s time-honored style lend the MINI Clubvan Concept its unmistakable character. Sharing the exterior dimensions of the MINI Clubman and boasting cleverly increased storage capacity, the concept car is the first premium model in the small-car-based van segment. The exterior appearance of the MINI Clubvan Concept marks it out immediately as a MINI – and therefore as a premium product. The function-led design modifications have no impact on the car’s proportions and hallmark MINI design language, but they do give customers the opportunity to combine the demands of commercial use with an appreciation of individual style. The MINI Clubvan Concept comes with British Racing Green exterior paintwork, which extends to the roof, C-pillars and exterior mirror caps. 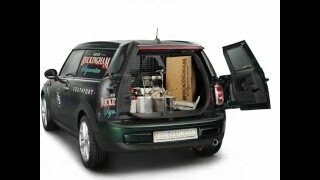 As is usual for vehicles charged with transportation tasks, the rear side windows of the MINI Clubvan Concept are opaque. Polycarbonate sections – their outer surfaces painted in the car’s body color – and heavily tinted glass for the rear doors make it difficult to see into the load compartment. The unbroken paintwork along the car’s flanks offers extensive scope for individualization, which the MINI Clubvan Concept highlights to eye-catching effect. The sealed side windows bear the logo of a sign design company based in the MINI’s native Great Britain. The hand-applied graphics lend the vehicle a personal look. Indeed, the ultra-versatile MINI carries both its cargo and the company’s promotional message with a uniquely stylish verve. The MINI Clubvan Concept presented in Geneva lends this form of customization a piquant authenticity – on two fronts. 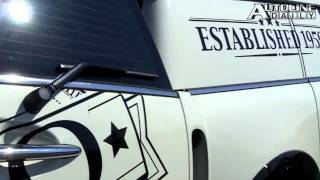 The British company that has literally left its stamp on the MINI Clubvan Concept creates similar vehicle graphics for its customers. And the MINI Clubvan Concept showcases how these might look when applied to a MINI van.